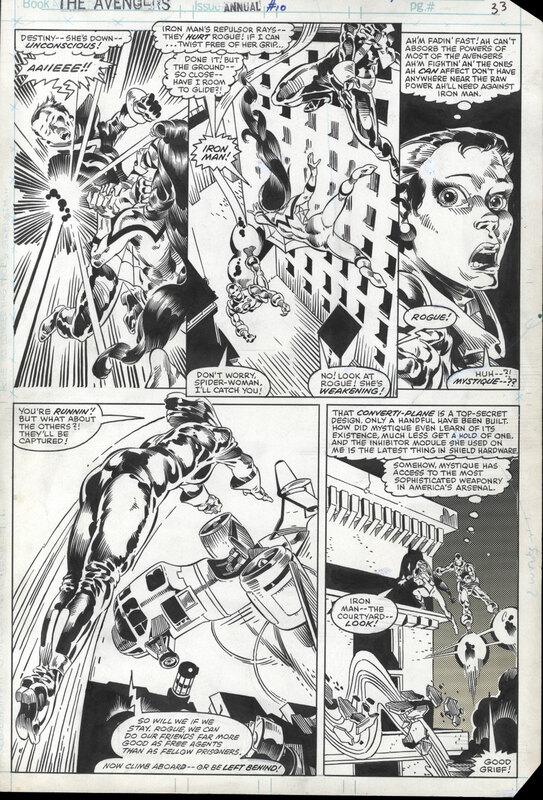 Similar to comic books, OA pages from the first appearance (“1st App”) issue of a prominent character command higher prices than pages from surrounding issues in the same run. This is on the assumption that the artistic team working on the 1st App issue is the same as that on the surrounding issues. Pages which actually feature said character from their 1st App issue are worth more than pages without that character. Generally, even these non-character pages fetch a premium to pages from surrounding issues. However, if the character is minor enough, non-character pages from their 1st App issue might not fetch a premium to pages from surrounding issues. Needless to say, a character’s popularity (which determines the demand or “key”-ness of their 1st App issue) impacts the pricing of their 1st App OA. If a character is popular enough, and their 1st App issue is considered a significant key, then generally all OA pages from their 1st App issue command a premium to pages from surrounding issues. Pages which actually feature said character from their 1st App issue can be worth multiples of the non-character pages. Broadly speaking, 1st App OA prices are determined by character, not artist. For example, the 1st App page of Wolverine from Incredible Hulk #180 fetched a record $657,250 in May 2014 (which is still the joint-highest priced public sale of American superhero OA). 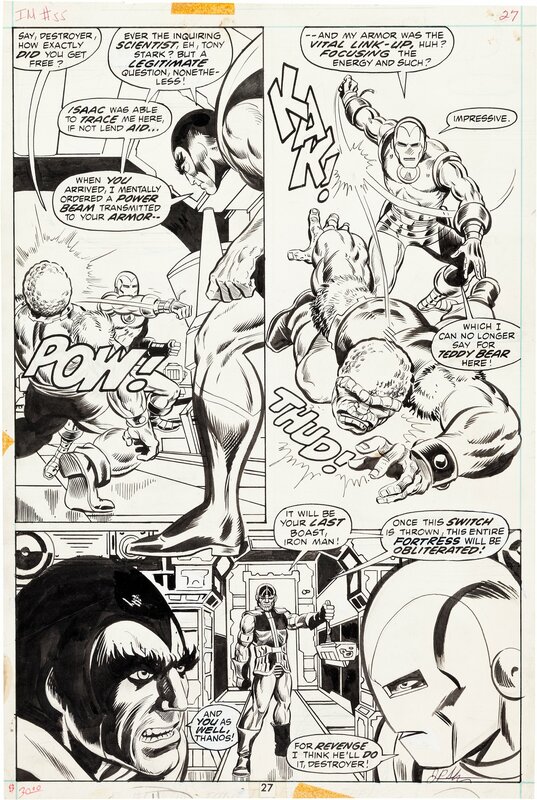 The penciller of this page is the late Herb Trimpe, who was a well-known and prolific artist, but whose Incredible Hulk panel pages usually fetch low to mid 4-figure prices. 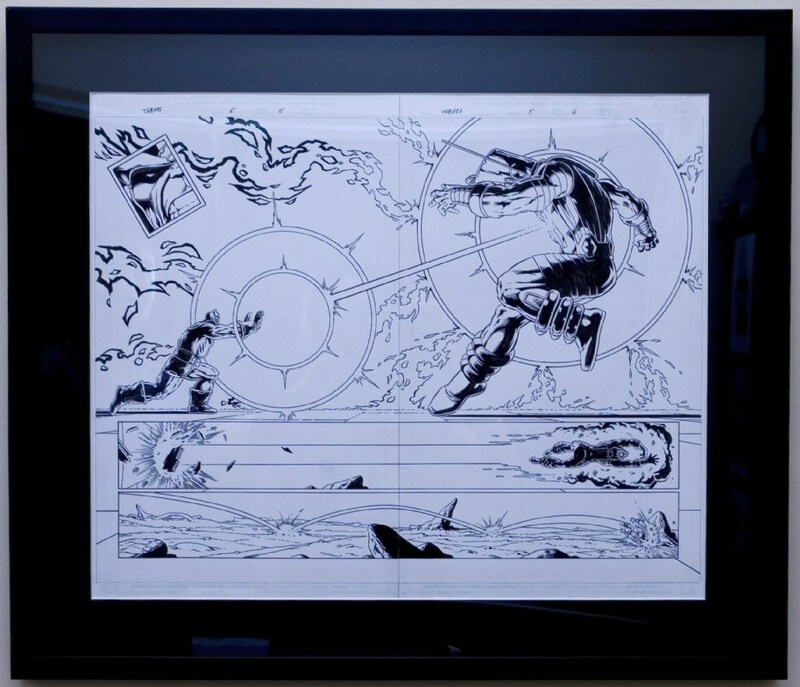 Another example is this Apocalypse silhouette page from X-Factor #6 (Apocalypse 1st App) which sold for $4,113 in March 2015. 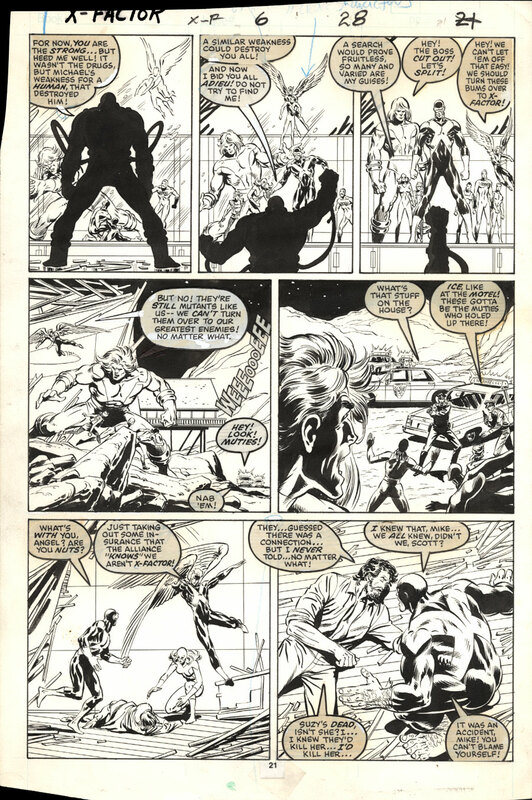 The penciller of this page is Jackson “Butch” Guice, whose X-Factor pages normally don’t fetch this kind of price. Sure, if these two characters were created by Jack Kirby in the early-’60s their 1st App OA would probably be worth more, but hopefully you get my point! The OA page on which a character makes their first published appearance usually commands a premium to that character’s other appearance pages from the same 1st App issue. 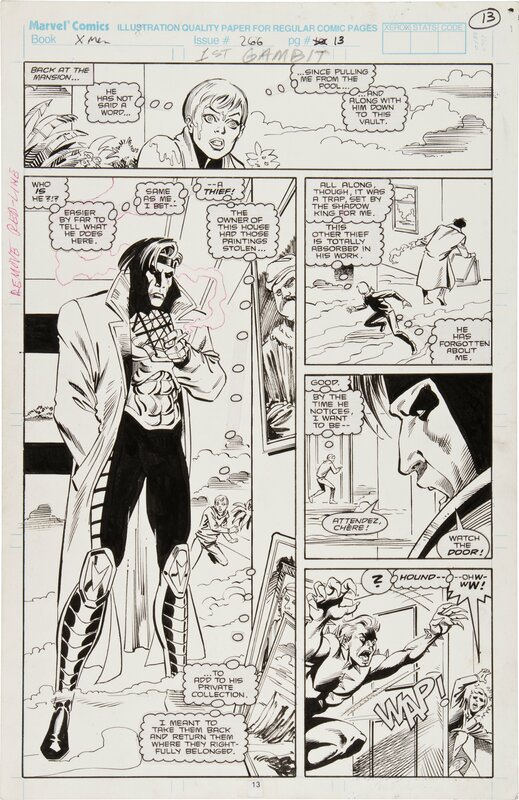 An example is this (pictured below) 1st App page of Gambit from Uncanny X-Men #266 (I’m blithely ignoring X-Men Annual #14 here) which fetched $7,767.50 in November 2011, versus another Gambit page from #266 which sold for $2,868 in August 2014. 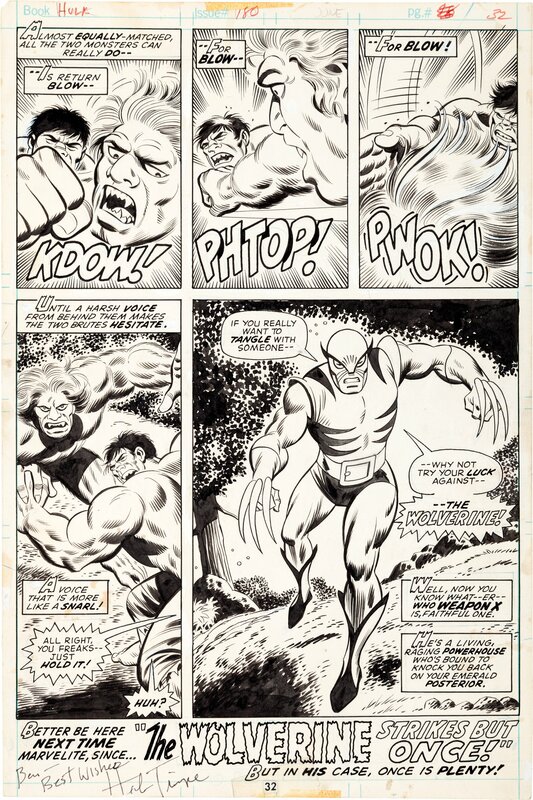 Perhaps another way to make my point is to state with certainty that no Wolverine panel page, from Incredible Hulk #181 or otherwise, would have fetched more than the abovementioned IH #180 page did when it was sold in May 2014. In general, the cheapest OA page from a 1st App issue (or any comic book) costs more than a CGC 9.8 copy of that same book. For example, this non-Apocalypse page from X-Factor #5 (Apocalypse cameo 1st App) sold for $286 in September 2015. Another example is this non-Rogue page from Avengers Annual #10 (Rogue 1st App) which sold for $7,366 in September 2015. For reference, this page from the same issue featuring Rogue sold for $17,501 in September 2015. 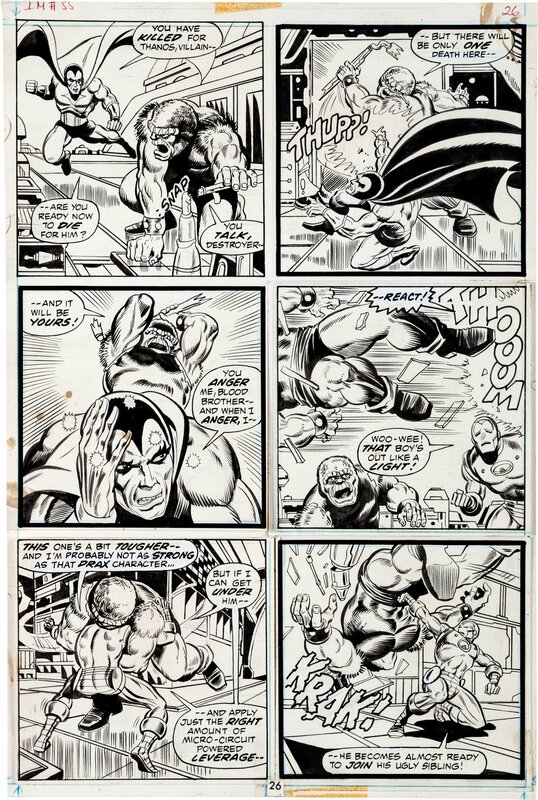 Avengers Annual #10 may present a slightly skewed pricing picture however, because there is only a small body of prime-era Michael Golden mainstream superhero artwork, and demand for it is extremely high. The stuff is literally “golden”! To further illustrate my points above let’s once again bring in everyone’s (my) favourite Mad Titan, and discuss Iron Man #55! IM #55 is a major 1st App key issue with recent sales of OA pages, perhaps prompted by interest arising from Thanos’ pivotal role in the Marvel Cinematic Universe. To recap, IM #55 is the 1st App of Thanos, Drax, Mentor, Starfox, Kronos and the Blood Brothers. The most expensive publicly sold IM #55 page is this one featuring a full-figure image of Thanos (albeit a robot duplicate) which fetched $20,912.50 in November 2016. This other page featuring Thanos’ boots(!) sold for $15,050 in December 2015. A non-Thanos page featuring Drax went for $7,767.50 in November 2014. This page without any of the characters whose 1st App was in IM #55, fetched $5,975 in November 2014. For comparison against other issues in the same run, this Iron Man #56 page also by Jim Starlin sold for $3,226.50 in November 2016. One thing to note is that the 12-month GPA average for IM #55 CGC 9.8 is $6k, which means that a lower-priced OA page from IM #55 could be close in cost to a CGC 9.8 copy (keeping in mind those cheaper IM #55 pages’ sales occurred in 2014, and prices have risen since). My theory for this is that with major vintage keys such as IM #55, CGC top census copies may indeed fetch almost as much as cheaper OA pages from said issue, due to large demand and lower supply of the book. Okay enough Thanos for now! As with comic books, OA should be stored and displayed away from UV light, in stable, cool and dry conditions. The black India ink used in OA is generally lightfast (doesn’t fade in UV light) and permanent (waterproof once dry). Grey pencil graphite is typically lightfast as well, but can be smudged via physical contact. Watercolour and acrylic paint can be affected by UV light. Marker ink usually discolours and fades over time. OA is normally done on Bristol board, which is a hardy thick paper, but should be kept away from UV light to prevent yellowing. When framing OA (or any art), make sure the artwork is not in contact with the glass/acrylic cover. In order to do this, place a mat border on top of the artwork or “float” the glass/acrylic above the artwork. Also ensure that all framing methods and materials used are of archival standards, and that materials in direct contact with the artwork are acid-free. The glass/acrylic used should be UV-filtering to minimize UV damage to the art and paper. Your articles are great. I’m learning quite a bit. Have been curious about OA for a while but feel like it’s a slippery slope since I feel like I’m spending too much on comics already. But love the raw look of the art. Nice read. I think this has become my new hobby. no more chasing stupid variants in order to save money for OA. Another sweet article. Keep up the good work! Thanks for answering my questions! That IH180/181 example was interesting, 181 still gets considered the 1st app of Wolverine but that panel from 180 would imo be more than just a cameo. I doubt the market will change anytime soon but 180 might be pretty undervalued.